Can Concrete & ICF Homes Really Survive Hurricanes? Concrete home and insulated concrete form (ICF) construction methods are one of the most wind-, fire-, and water-resistant building methods of the modern era as well as the green building movement. If you’ve been watching the news about Florida’s devastating category 4 hurricane, Hurricane Michael, you will know the answer to this question—yes, concrete homes can absolutely withstand hurricanes! One home in particular, called “The Sand Palace” by its owners has become an icon for above-code building (check out this NY Times article). In an apocalyptic wasteland of completely leveled homes, this concrete constructed home still stands tall and was relatively unscathed after storm surges and 155mph winds battered the area on October 10th. Meanwhile, neighboring traditional stick-built homes are simply gone, leaving only a concrete slab as evidence of their existence. 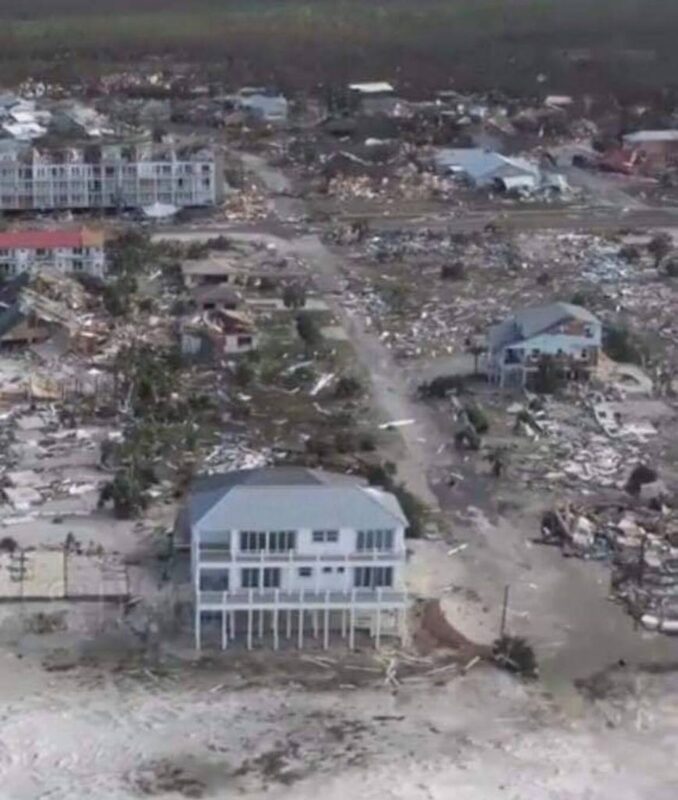 Images of “The Sand Palace” after Hurricane Michael. Courtesy of Sand Palace Facebook page. The sturdy Mexico Beach home was built with 40-foot concrete pilings designed to rise the home above ocean surges and energy-efficient impact-resistant windows and doors sealing the building envelope. Walls were built of 1-foot thick poured concrete, reinforced with rebar and cables. Insulation is not as much of a concern in Florida, and so it is unclear if the home used the insulating foam component of ICF construction, however the system of reinforced poured concrete walls are identical in both insulated and un-insulated building methods. While tragic, these are the situations that often improve building codes and, in the end, save lives. We are big supporters of concrete and ICF construction here at PCAP. One of our favorite projects, a net zero energy home we designed in Northport is built using ICF construction. Not only are concrete buildings built to last, saving embodied energy and reducing long-term building materials waste, but these types of buildings are almost always more energy efficient, reducing our dependency on environmentally harmful energy sources. We often get asked about building codes—can’t we just build “to code”? How far above code should we build? Our answer is, as far above as you can afford! The building code is the bare minimum an architect can design before breaking the law. No one goes to their doctor and asks them for the minimum amount of care before they are considered negligent, before the doctor breaks the law. Why would you build to the bare minimum of quality with a building that is protecting your family? The Sand Palace is an amazing example of a building that was built above code to a real-world owner-requirement of withstanding hurricanes and today the owners of that home are reaping the rewards of that decision.